Change up your pup's chewing routine with USA Antlers Elk Rack Snacks and do no harm! 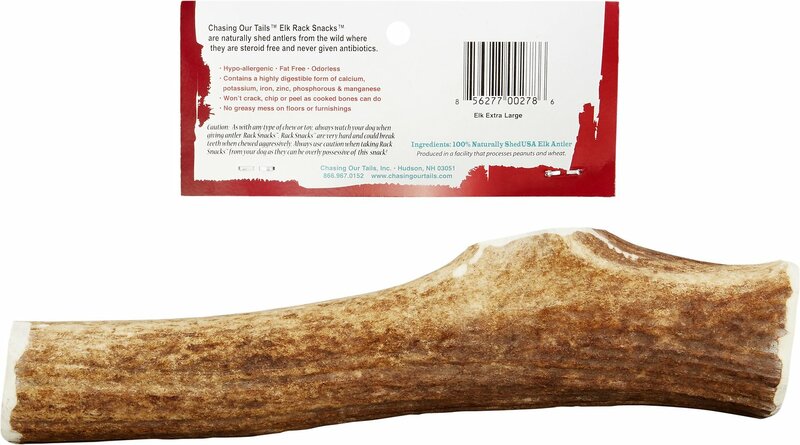 These exceptional, sink-your-teeth-worthy antlers are 100% naturally shed—which means that no animals were hunted or farmed to bring this chew into your routine. The all-natural chews are a fantastic source of calcium, zinc, manganese and potassium, which can help prevent tartar just as much as healthy chewing habits. 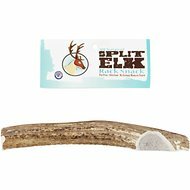 Best of all, elk antlers don't typically chip, splinter or peel as a cooked bone can, so they're safer for your beloved pet's digestive track. 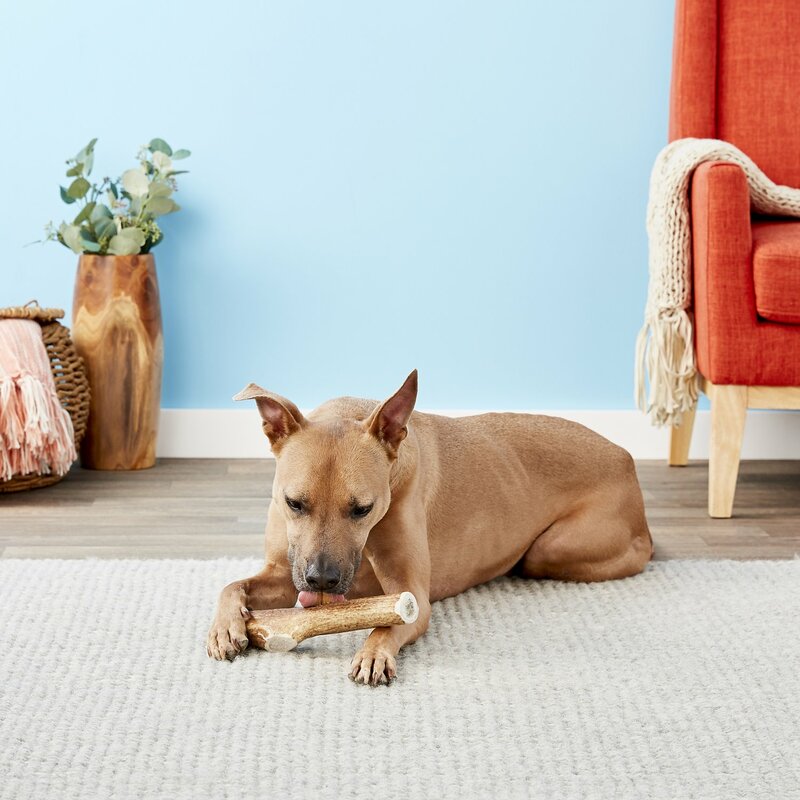 If your dog likes to chew and destroys toys, these antlers can help curb that natural urge to chew and encourage healthy habits—such as munching on antlers and sparing your favorite shoes. 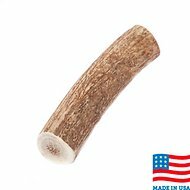 This all-natural, durable, long-lasting chew is naturally shed and perfect for aggressive chewers. May be used indoors because there's no odor, fat or greasy mess for you to clean up. Substantial source of calcium, zinc, manganese and potassium for tartar control. Antlers are unlikely to split or chip like other bones, making them a safer chew. No two antlers are the same, so your dog will feel like she's getting something new every time. I am always hesitant to purchase these antlers online because of the sizing. I decided to try it since I had a coupon and free shipping. This wasn't 10-12 inches as advertised. It was 9 1/2 inches. I probably won't order these again from Chewy because I feel I was overcharged. If they were going to send me the smaller size, they should have charged me the smaller price. Live and learn. Otherwise, my dog loves it! This was the best purchase I’ve ever done, I have three labrador retrievers. All three of them love the , So I bought another one this time. It keeps them occupied for hours. Every time one antler gets down really small I will buy another one. I have a 90 pound chocolate Labrador. He’s a heavy chewer so buying him toys and things to keep him entertained is hard. I’ve been buying elk antlers for 2 and half years. (He’s 4) They last for about six months and keep him very entertained when he’s feeling bored and have the urge to chew. This one is very good quality and a very reasonable price. Will buy again in the future. The size we ordered was 10-12 inches. It was 10 inches exactly, no bigger. It was much thinner than antlers we have purchased in the past from other sites. Our Golden Retriever is an aggressive chewer so I don't expect this antler to last too long. For the price, we expected the antler to be much thicker. 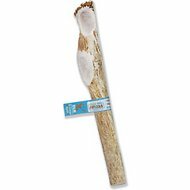 My dogs loved this antler however the one I received was thin with rough jagged edges and pieces broke off easily. I had also ordered a Buck Bone Organic antler that was much better. Great chews for an active dog. This was the second one I bought, it looked small when I saw it so I measured it. it was a fraction shorter than the lower end of the range. one third was under 1 inch in diameter, another third was less the 2" in diameter, the rest went from 1.5"- 1". I was extremely disappointed in this one and probablely won't buy from here again, I'll buy from a store near my house where I can pick and choose. My lab ate this undersized antler in about 45 minutes. The flat antler was not worth the money. I’ve ordered elk antlers for our big dogs before and when they came they were scrawny and only lasted a few days (different supplier). I was so pleased to open my box and find a huge antler-just as I paid for. My dogs think this is AWESOME!! 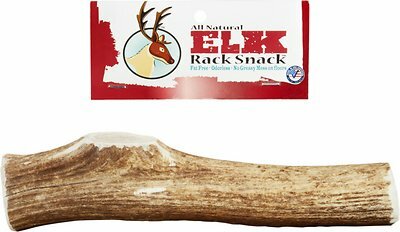 We have purchased antler snacks from other vendors. This was the best size (biggest) and least expensive. Very satisfied. The dog likes too.